Steampunk. Oh boy, oh boy, oh boy! That's what kept going through my head as I opened the package containing Christi Friesen's new book, Birds of a Feather . At 50 pages, Birds of a Feather is a pretty small book. But Friesen fits a lot into that space — each page is packed with pictures and text. She fits it all in beautifully, too. This book is an example of self-publishing gone very right. I love the cover (much better than the last book's cover), I love the illustrations... I love it all. Well, almost all. The pages seemed glossier than the average craft book, which made it a little hard for my tired eyes to read (still doing those midnight feedings for the little guy!). The book itself is a little flimsy (think pamphlet or magazine) — but on the up side, that makes it easy to keep it open on the desk while working through projects. I like the way Friesen starts with a short intro to clay at the front of the book (just 2 pages), then puts the rest of the reference materials in the back. It makes it easy to jump right into the projects. She also puts repetitive instructions in the back — the types of instructions that are needed for multiple projects. That's part of how she packs so much information into such a short book. The book is full of puns and witty writing. It's also full of fun. Friesen's books encourage folks to just have fun with clay. You can do a "Lookit" blend instead of a Skinner blend. You're "lectured" on the importance of doodles. Creatures don't have to be realistic — they can be completely made-up. She encourages you to focus on the artistic and creative process, which is a nice break from fussier technique-driven books. I was pleasantly surprised with the variety of projects in this book. I was expecting it just to be birds. (And there were plenty of those.) But the feather project and bird nest project made sure things didn't get boring. And Friesen's always good about including photos of variations for each project. Parrot: Stitching with wire — interesting! Toucan: Nice method for feathering the head color onto the body. Birdnest: Uses twine, thread, and wires. Lots of mixed media in this book. Steampunk: Suggests laying out embellishments so you have lots of choices visible. This is one of my favorite ways to work. Swan: Very pretty. I like how she puts gold mica powder on top of the gold leaf. All of the projects are illustrated with a nice number of step-by-step photos. However, the photos are pretty small. Sometimes it's hard to see the details she's pointing out in the related text. Not only that, but since they're unlabeled (and scattered all over the page), it's sometimes hard to figure out which photo goes with which text. I got a little lost on one of the projects because of this. Did I mention I was excited about trying the steampunk project? It didn't disappoint. I ordered some steampunk findings (Friesen lists sources in the book, or you can buy them on her site), spread them out across my desk, and started playing. It was a little more tedious than I expected. I was grateful more than once that I had a magnetic tool close-by for finding tiny runaway screws. (And I didn't trust my cats alone with that stuff for a minute!) But I definitely enjoyed it. Nice variety of projects and creative techniques. Book is laid out beautifully and written in a fun, easy-to-read style. Encourages you to focus on creativity. format seems a little flimsy. The photos are small and unlabeled, so it can be difficult to follow along. 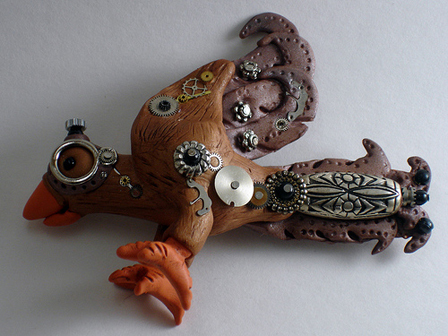 Bird or steampunk aficionados, regardless of whether or not you've read the other books in Friesen's series. Beginning clayers will enjoy the book and have good results following her instructions. Intermediate clayers will find some interesting tips and techniques, too. My review of Christi Friesen's book, Birds of a Feather (Beyond Projects: The CF Sculpture Series, Book 6). Throwing broken clock pieces on an item does not really make it Steampunk. 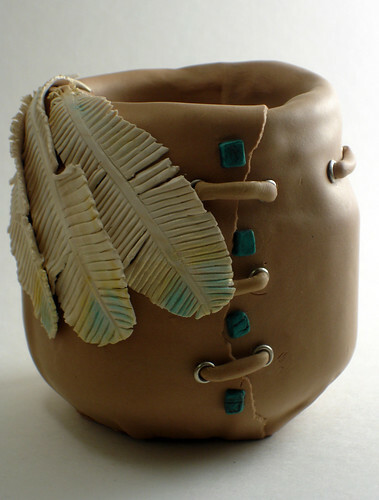 Explain to me how that clay looks like an alternate retro-futuristic Victorian era English piece? That being said, I have no problem with gears thrown decoratively into polymer clay, *and I do it myself*. I just wish we had more names for subtleties in the genre. Interesting point. To me, this *is* steampunk because it's the type of work I've seen associated with that term. I'd love to learn more, though. Any favorite artists or sites you can recommend?